Obesity is a very common problem today. Divya Medohar Vati is the herbal solution for weight problems. 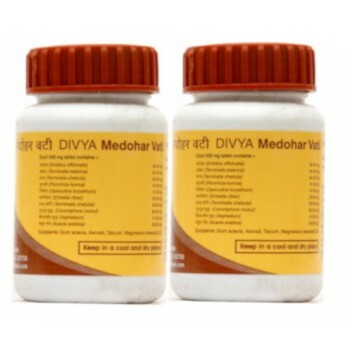 It improves the metabolism and regulates the digestion. Essential for weight management is a healthy digestion. Only with a healthy digestive system food gets properly absorbed and the body gets the necessary nutrition for strong bones and healthy tissues. 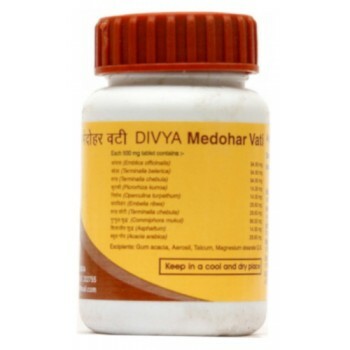 Divya Medohar Vati contains the combination of herbs that is helpful for an effective burning of the stored fat in the body and weight loss. Avoid oily and sweet food. Medisynth - Phytofit 30 ml Obesity is a condition when there is an abnormal proportion of..
SBL Homeopathy - Phytolacca Berry 25 g A unique formulation of homeopathic remedies for t..
DR. RECKEWEG R59 - Obesity and Weight Drops 22 ml Indications: Obesity, tendency to ..
Dr. Schwabe Homeopathy - Phytolacca Berry Tablets 20 g Made from authentic source i.e. fres..
ADEL Germany Homeopathy - ADEL13 Fattex Drops 20 ml A unique homeopathic formulation for the no..